Haverford High School, Havertown, PA. Throughout high school, attended Saturday art classes at the Philadelphia Museum College of Art (now the University of The Arts). 1969: BA, Psychology, Trinity College, Hartford, CT.
1970 – 1977: Taught special education at the Grove School, Madison, CT and then at the Reece School in New York City while attending the School of Visual Arts, Parsons School of Design, and the Art Students' League. 1985: Began exhibiting at various art festivals, including several in Florida. 1986 – 1989: Wintered in Key West, FL, where his interest in things tropical grew and developed. 1992 – present: Divides time between Pennsylvania, and Florida with occasional trips to many of the islands of the Bahamas and the Caribbean, a great source of inspiration for much of current work. 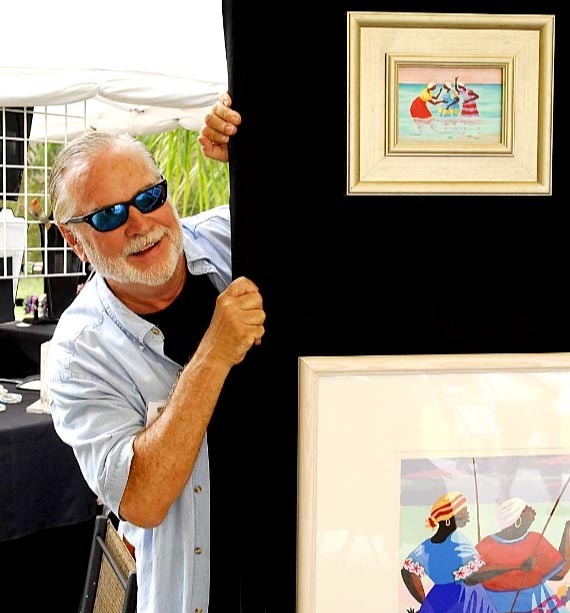 William exhibits in art festivals throughout Florida during the winter months and in the Mid-Atlantic and New England states during the summer. The Northeastern United States is also a great source of inspiration for many of the works. William loves his Border Collie, Catty! ART FAIRMOUNT PARK, PHILADELPHIA, PA.
ART IN NEW HAMPSHIRE FESTIVAL, MANCHESTER, N.H.
BAYSHORE ARTS FESTIVAL, BAYSHORE, N.Y.
FORT LAUDERDALE (NEW RIVER) FESTIVAL OF THE ARTS, FORT LAUDERDALE, FL. NEW MILFORD ART FESTIVAL, NEW MILFORD, CT.
NEW HOPE ARTS AND CRAFTS FESTIVAL, NEW HOPE, PA.
VERO BEACH “UNDER THE OAKS” ART FESTIVAL, VERO BEACH, FL. THE SALMAGUNDI CLUB, NEW YORK, N.Y.
WASHINGTON SQUARE OUTDOOR ART EXHIBIT, NEW YORK, N.Y.